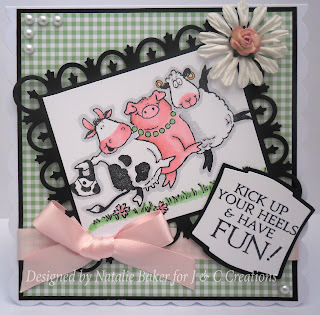 I love this Penny Black stamp, I just have to smile when I look at the animals having a ball, or perhaps it's the cow toting her cowhide handbag, lol! Mount a square of green checked paper onto black card. Attach a length of ribbon and secure on reverse and then glue onto your card blank. Mount your coloured image onto the Spellbinders Fleur de Lis rectangle and stick onto your card using 3d foam. Stamp the sentiment onto white card and cut out using a Spellbinders Labels 2 die. Mount this onto black card cut using the next size up die. (I trimmed the black label down as I thought the border was too large) and stick at an angle using 3d foam. Decorate with pearls, flower and bow.